A new cookbook in the mail is some of the best kind of mail out there. I was very excited when the Starters & Sides Cookbook showed up in my mailbox recently. This cookbook, by Leah Schapira and Victoria Dwek of Ami Magazine and CookKosher.com fame, is just as beautiful and just as well laid out as their Passover Made Easy cookbook that I featured this past Spring. This cookbook features pages and pages of easy to follow recipes for tasty and innovate side dishes, appetizers and salads. This cookbook is totally made for me. I love side dishes! I could make a dinner out of the appetizer menu! When this cookbook showed up, I quickly ripped it out of the packaging to page through the book. Like the Passover cookbook, the book features some fantastic tips and ideas. The recipes are simple, without complicated ingredients. Every recipe features a full-color photo, which is always helpful. I especially liked that there were many recipes in the cookbook that were vegetarian and most of the recipes didn’t use processed products. I tried to stick to whole foods as much as possible. A recipe that caught my eye, that I thought would be perfect for an upcoming dinner I was hosting, were the kishka and zucchini towers. Homemade kishka is a fantastic treat once in a while. This vegetarian appetizer is perfect for shabbat or any other dinner when entertaining. Sharing the recipe with you today. In addition to the cookbook that the publisher sent me, they have also graciously offered one cookbook for one of my lucky readers. Don’t forget to enter the giveaway below! Good luck! Hope you enjoy the cookbook as much as I did! Preheat oven to 350ºF. Line 2 baking sheets with parchment paper. Prepare the kishka: In a small bowl, combine flour, breadcrumbs, brown sugar, paprika, salt, and pepper. Stir in water and oil. Mold the mixture into a log that is the same width as your zucchinis. Freeze log for at least 15 minutes. Place zucchini rounds on one prepared baking sheet. Remove kishka from freezer and slice into ½-inch rounds. Place kishka rounds on second prepared baking sheet. Brush zucchini and kishka rounds with olive oil. Season with salt and pepper. Bake for 45-50 minutes until zucchini is tender and kishka and zucchini are golden on the edges. Remove from oven. 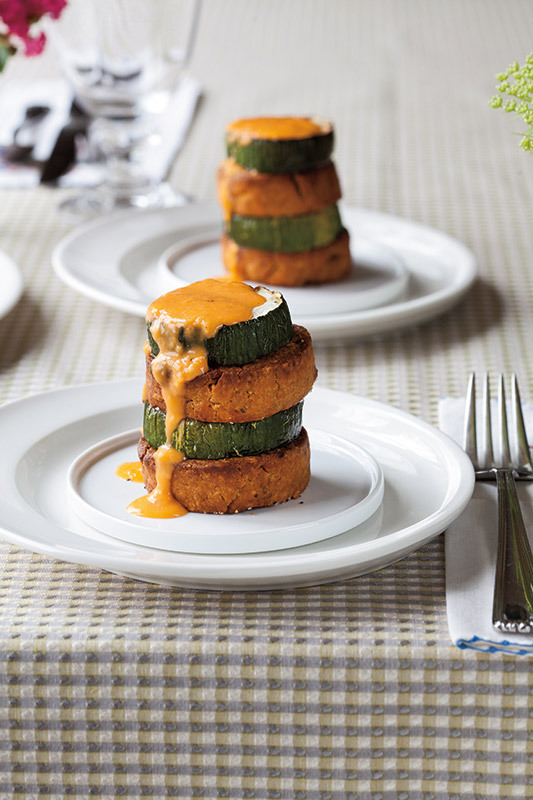 Create towers by topping a kishka round with a zucchini round, another kishka round, and a second zucchini round. Looks like a great cookbook! I love my teriyaki chicken salad, Simple but so good. Roasted veg are always my go to in a pinch! Roasted asparagus with olive oil and sea salt is definitely my go to side dish! I so want to try this cookbook! One of my favorite side dishes is a simple broccoli salad. Roasted root veggies with rosemary. BTW, what do you think is the sauce in the picture? Honey Mustard? roasted veggies. also, this recipe is such a simple delicious sounding and fancy idea! orzo with roasted veggies or salad w strawberries,mango,craisins and candied pecans! this looks great, thanks for the chance! My go-to salad is terra chip/turkey salad! I need new ideas for side dishes. This book sounds awesome. I usually do something simple like steamed veggies or rice. Avocado and hearts of palm salad! Gosh I have so many goto sides… right now my best one is a quinoa salad with peppers, onions, chickpeas and more! YUMMY! I love the avocado/tomato/hearts of palm salad!! Definitely the hearts of palm/tomato/avocado, or a simple Israeli salad. That recipe looks delish! Have you made it yet? Apple-walnut salad and popcorn cauliflower are two of my main defaults. Pasta salad of any kind! sweet potatoe pie is my go to side dish! I have a great quinoa salad with a tumeric curry dressing. I have the quinoa made before Shabbos and can then quickly throw all the ingredients and dressing together right before the meal. beautiful pic and creative use of kishka! I love making roasted green beans- so easy and yummy! Great review Hindy. I especially like that you mentioned that the recipes don’t have many processed ingredients. Apple kugel is my standby. Looks like another awesome title from this pair. 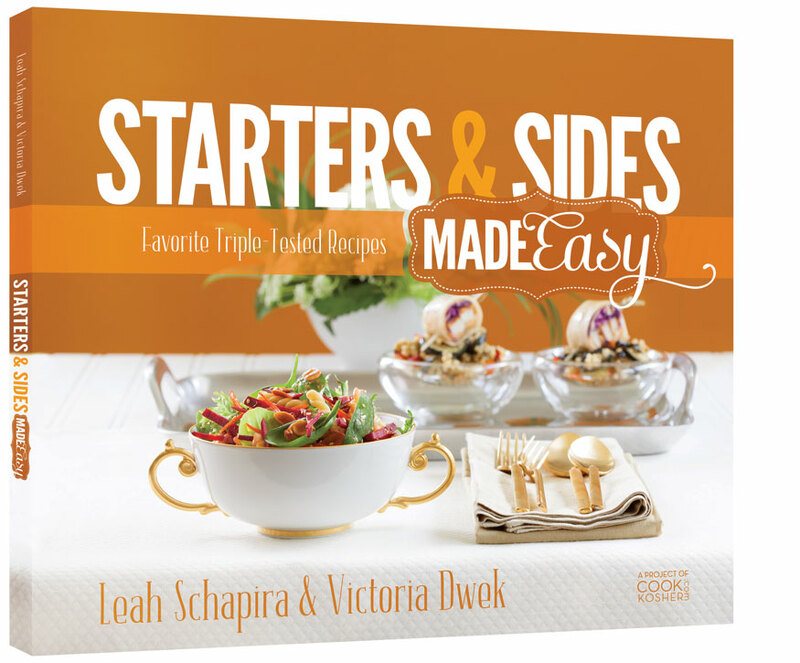 Everyone needs more recipes for starters and sides, so this is a terrific idea for a cookbook. And I haven’t has kishke is years and years! I remember loving it. As in Hip Kosher Ronnie Fein? Most awesome cookbook! Wish it had pictures though. Sounds like the perfect cookbook for me. The one cookbook I really need!!! Love the kishke / zucchini stacks! I would love to add it to my cookbook collection. Recipe above looks great! these are so pretty—i’m sure they’re delicious, too! I would love to own this cookbook, its a great idea! I would never have thought to put kishka and zucchini together like that!